Well, talk about a tale of two meetings. The one hosted by President Trump with those who have been victimized by mass shootings was respectful, grounded, and doled out logical solutions. Yes, there was some talk about assault weapons bans and Australian-style gun control, but a lot of family members who lost their loved ones to gun violence said more armed guards, possibly the teachers themselves should be considered. Better security at schools concerning access to buildings also need to be addressed as well. That was earlier in the afternoon on Wednesday. Later that evening, CNN held a town hall event in Sunrise, Florida. The National Rifle Association agreed to participate, along with Sens. Marco Rubio (R-FL), Bill Nelson (D-FL), and Rep. Ted Deutch (D-FL). It was a hostile environment. Period. Sen. Nelson wants a new ban on so-called assault weapons. He slammed Gov. Rick Scott for incentivizing a gun manufacturer that makes the AR-15 rifles to move to Florida. That was the main course in this segment, which was broken up into two parts. The second half was with NRA spokesperson Dana Loesch and Broward County Sheriff Scott Israel. A teacher wants the 2nd Amendment explained to her as the crowd cheers taking away semi-automatics. This is a better ad than the NRA could have ever hoped for. 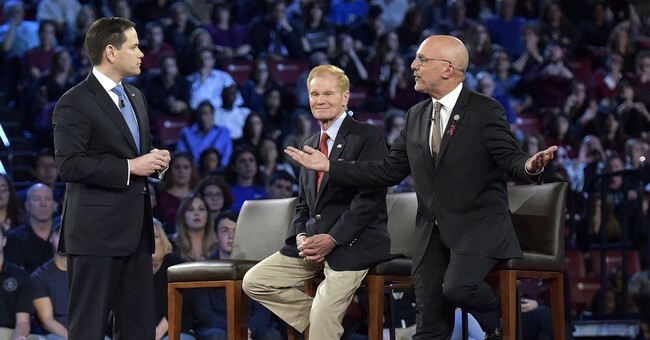 Look at me and tell me guns were the factor in the hunting of our kids in the school this week,” Fred Guttenberg, who lost his 14-year-old daughter Jaime in the shooting, asked Rubio. She had been running down the hallway when she was shot in the back, Guttenberg said. “Were guns the factor in the hunting of our kids?” Guttenberg asked. Rubio said he would support a law that makes it illegal for 18-year-olds to purchase rifles, as well as the banning of bump stocks and expanded background checks. He said he pushed for a $50-million-a-year threat-assessment fund so states could identify people who could potentially commit mass shootings, and stop them. It’s here that the crowd’s enthusiasm for gun confiscation became explicitly clear. The second segment saw Dana Loesch taking serious heat from the audience, with more than a few people calling her a murderer. She noted that this was a monstrous act, and that the shooter, Nikolas Cruz, shouldn’t have been able to buy a firearm. The background check system needs to be updated and reformed, so that his disturbing behavior could be properly documented in the system. Cruz had no prior criminal convictions and was not adjudicated as mentally defective, which would have barred him from buying an AR-15. On January 5, the FBI received a tip that Cruz could carry out a school shooting. The bureau never followed up on it; something FBI Director Chris Wray admitted last week. The FBI was invited to the town hall event, but declined. They dropped the ball, as did local law enforcement, which visited his home 39 times over a seven-year period, documenting episodes that were described as that of a “mentally ill person.” There were many red flags that were not acted upon, something that Loesch pointed out during this second hour of the town hall event. If you think @dloesch murdered kids in Parkland rather than an evil shooter, your morality is skewed nearly beyond repair. Yet, where things got ugly was when Loesch was asked why the NRA position is not to raise the age of purchasing long guns to 21. She mentioned Kimberly Corban was on a previous CNN town hall on the Second Amendment when Obama was president; he mansplained gun politics to her, by the way. She was brutally raped in college and wishes she was able to defend herself with a firearm, probably a shotgun, which drew boos from the crowd. Yeah, that’s the anti-gun Left, people. Now they're booing Kimberly Corban's story of wanting a gun after being raped. This is completely off the rails. I don’t get it. I just don’t get how anyone could even consider that the position of leaving women unable to defend themselves from rapists and others who seek to do harm to them is fine. The reaction on this front was appalling, but women are becoming a bigger voice in the gun industry, with many think they’re rapidly becoming the next frontier. More women are lining up to obtain their concealed carry permits, shooting sports participation is up, and they’re the fastest growing demographic embracing gun ownership. Second, what about all the signs Cruz was exhibiting? Was it the gun? Or was it that all levels of government failed to protect these kids? It’s the latter. Is our system broken or is it that the front office handling the management of this system—NICS—has to do better at their jobs? The FBI dropped the ball here, folks. That is a fact. The FBI manages the background check system. Does anyone not think that armed guards, better security at schools, better mental health detection, proper documentation of disturbing behavior, and the ability to update NICS with this information could stop people who shouldn’t have firearms from obtaining them? I think it can. But that doesn’t ban so-called assault weapons or limit magazines, so it’ll be unacceptable to the anti-gun Left. The confiscatory ethos permeates every policy initiative they dish out. What happened last night was a North Korean kangaroo court and every conservative, every Second Amendment supporter, every NRA member, and anyone in America who wasn’t onboard with gun control was on trial. We’re guilty of supporting American civil rights and freedom. This is basically just a big gun control rally. Lots of insanely overheated rhetoric. This starts off in a really disappointing way with one of the students attacking Dana for not caring about her own children. Gross. Pretty ridiculous for the Sheriff who actually could have stopped the shooter during his departments 39 interactions with him but didn't to blame anyone else for what happened. Just lots of angry screaming at Dana Loesch. Tapper, to his credit, is trying to let Dana answer the questions. Suddenly, when the Sherrif's own very significant failure is brought up, the only one responsible for the shooting is the shooter. Quite the turnaround. This really devolved into a two minutes of hate rally directed at the NRA. This is as partisan as it gets. When people say it’s not about red states and blue states, it is. When they say it’s not about Republicans and Democrats, it is. We’re about to go to war over the Second Amendment freedoms in America again—and CNN helped fire the first salvo. I hate the Left for this. I want to grieve for these families. It’s not right that my first instinct is how are we going to defend against the anti-gunners' pervasive nonsense on this issue. Yet, that’s where we are. We're stacking sandbags because I think a concerted assault against the Constitution is coming. As a proud American, I cannot let that happen. The Free Beacon’s Stephen Gutowski was apt in describing the whole show as a two minutes of hate against the NRA a la Orwell’s 1984. I guess a silver lining is that a lot of people gave Loesch and Rubio credit for venturing into lion’s den. Gun sales might spike over the theatrics. But make no mistake; these people are coming after us. It’s time to beat them on the battlefield of ideas (again), though this time I’m expecting a harder slog. @DLoesch Thank you for showing tonight. A step in the right direction and would love to see more. I am not a NRA member but want to hear from you. @DLoesch while I strongly disagree with the @NRA's platform, I appreciate the fact that you showed up, took the heat, and spoke to survivors and made it clear that we, yes gun-owners too, will not tolerate weapons falling in the hands of monsters. @DLoesch we do not agree on almost everything, but you showing up was amazing! I really hope that other people follow your lead. Totally professional and respectful. I know it was hard, but I hope you were able to hear what they were trying to tell you. I know I heard you. The event was held after Cruz shot and killed 17 people and wounded at least a dozen more at Marjory Stoneman Douglas High School in Parkland, Florida last Wednesday. Full disclosure: I renewed my NRA membership yesterday.